^ Facts & Figures. June 30, 2012 [December 26, 2012]. （原始内容存档于2013年4月16日）. 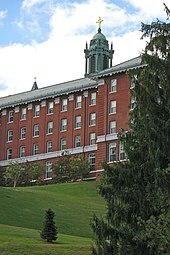 ^ College of the Holy Cross. U.S. News and World Report. [2015-03-08]. ^ When the Navy docked on the Hill. Worcester, Massachusetts: College of the Holy Cross. 2011 [September 28, 2011].